I went on a bus club trip on this bus to visit the bus depot in Leyland Lancashire of John Fishwick & Sons. 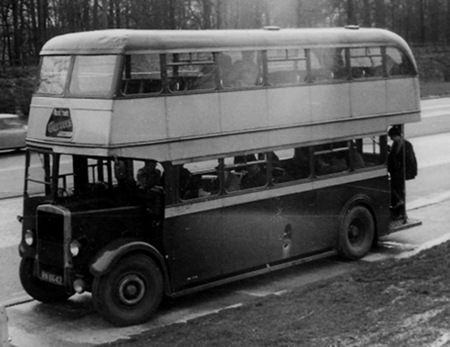 Fishwicks were and still are a large independent operator with services in the Leyland, Chorley and Preston area. This bus was ex Ribble and finding precise information is not easy but what I did find was that a Ribble TD5 registration RN 8622 is preserved and owned by the Ribble Vehicle Preservation Trust. There is only a difference of 20 in the registration and having scrutinised photos of them both I can fairly safely say that they are both from the same batch of vehicles. It would appear that they originally had Burlingham bodies, but during the war years maintenance was concentrated on mechanical servicing rather than the bodywork so by 1949 they had to be rebodied by Alexander. Ribble actually rebodied 148 TD4s and 5s and 81 single deck TSs and whilst at it any petrol engine vehicle was converted to an oil-engine. The TD5 of Ribble Vehicle Preservation Trust can be seen here.